Periodontal disease or gum disease, a chronic inflammation and infection of the gums and surrounding tissue, is the major cause of about 70 percent of adult tooth loss, affecting three out of four persons. Bacterial plaque a sticky, colorless film that constantly forms on the teeth is recognized as the primary cause of periodontal disease. If plaque isn't removed each day by brushing and flossing, it hardens into a rough, porous substance called calculus (also known as tartar).Toxins (poisons) produced and released by bacteria in plaque irritate the gums. These toxins cause the breakdown of the fibers that hold the gums tightly to the teeth, creating periodontal pockets which fill with even more toxins and bacteria. 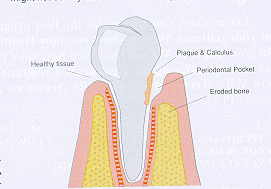 As the disease progresses, pockets extend deeper and the bacteria move down until the bone that holds the tooth in place is destroyed. The tooth eventually will fall out or require extraction. Yes. Genetics is also a factor, as are lifestyle choices. A diet low in nutrients can diminish the body's ability to fight infection. Smokers and spit tobacco users have more irritation to gum tissues than those who don't, while stress can also affect the ability to ward off disease. Diseases that interfere with the body's immune system, such as leukemia and AIDS, may worsen the condition of the gums. In patients with uncontrolled diabetes, where the body is more prone to infection, gum disease is more severe or harder to control. Signs include red, swollen or tender gums, bleeding while brushing or flossing, gums that pull away from teeth, loose or separating teeth, pus between the gum and tooth, persistent bad breath, change in the way teeth fit together when the patient bites, and a change in the fit of partial dentures. While patients are advised to check for the warning signs, there might not be any discomfort until the disease has spread to a point where the tooth is unsalvagable. That's why patients are advised to get frequent dental exams. In the early stages, most treatment involves scaling and root planing-removing plaque and calculus around the tooth and smoothing the root surfaces. Antibiotics or antimicrobials may be used to supplement the effects of scaling and root planing. In most cases of early gum disease, called gingivitis, scaling and root planing and proper daily cleaning achieve a satisfactory result. More advanced cases may require surgical treatment, which involves cutting the gums, and removing the hardened plaque build-up and recontouring the damaged bone. The procedure is also designed to smooth root surfaces and reposition the gum tissue so it will be easier to keep clean. Removing plaque through daily brushing, flossing and professional cleaning is the best way to minimize your risk. The general dentist usually detects periodontal disease and treats it in the early stages. Some general dentists have acquired the additional expertise to treat more advanced conditions of the disease. If the general dentist believes that the periodontal disease requires treatment by a specialist, the patient will be referred to a periodontist. Patients should visit the dentist every 3-4 months (or more, depending on the patient) for spot scaling and root planing and an overall exam. In between visits, they should brush at least twice a day, floss daily, and brush their tongue. Manual soft nylon bristle brushes are the most dependable and least expensive.